We invite you to visit our friendly showroom in Halifax, where you will be able to view a selection of elegant, traditional and modern cakes. All our cakes are crafted to impeccably high standards by professionally trained staff. With its excellent reputation 3 Tier was established in 1988 and is a wonderful world of cakes. Choosing a cake for your special day is not always easy but once you have visited our showroom, and browsed through our portfolio, sharing your ideas for your unique design, you will not be disappointed. For more information or to book an appointment please call 01422 330441 and we will be happy to help. 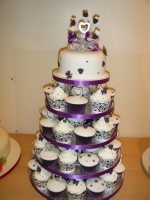 You can also take a peek at some of the cakes we create at 3 tier please visit our gallery section of our website. Friendly experienced down to earth staff, whatever your budget give us a try!!! Carol & her team have a weath of experience in all aspects of floral design & decoration, from large to smaller weddings and whatever size your venue from modern to traditional, elegant to stunning, Carol will help create your dream. For further information or to make an appointment please call 01706 810722 we can help turn your ideas and wedding dreams into reality.